After 1853, the easy-to-find gold had been found in California, so the gold frontier required hydraulic mining: blasting water at mountains to turn the rock into crumbles that could be sifted for gold, in a much more technical, expensive, and environmentally-destructive process. Instead of independent prospectors hoping to strike it rich, hydraulic mining was led by corporations who hired wage laborers. Independent miners could not survive the corporate competition. Nearby farmers often could not survive the loss of the local water, or the polluted run-off from hydraulic mines. Compare this image of the gold rush to what you already knew from elementary school, museums, or popular culture, which usually focuses on the brief 1849-1853 period of independent miners panning the rivers for gold. What do you think: why is that brief period remembered much more than this long-lasting corporate period? And how does the frontier look different when we start to think about the environmental consequences of it? One visitor to a hydraulic mining site wrote, "Nature here reminds one of a princess fallen into the hands of robbers who cut off her fingers for the jewels she wears." Frontier settlement relied on extractive industries: extracting fur, lumber, feathers, gold, coal, grain, livestock, minerals, oil, and other natural resources for human profit. Much of this was destructive, especially in the early years of European settlement. 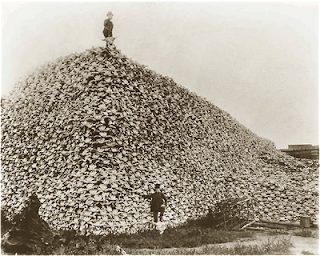 This photograph shows a pile of buffalo skulls around 1870. Buffalo were particularly easy to hunt: many people shot them from the windows of the new railway cars. Some used the bodies to provide food for railroad workers and used the hides to provide material for making factory conveyor belts – but other hunters just left the bodies to rot, collecting only skulls as trophies. The government paid hunters for each buffalo skull, because the U.S. government wanted to clear the land for farmers, and to drive out the Indians who depended on buffalo for food and clothing. Buffalo were hunted so heavily that they were nearly driven to extinction, even though their numbers had been so enormous that they had once seemed to blanket the Great Plains. As you read in Ben Johnson, by 1900, herds that had numbered close to 40 million were reduced to a few remnants, mostly in Yellowstone Park and a few private ranches. What do you think: can we keep this photograph in mind along with the image of Turner's noble independent cowboy? Americans' attitudes towards the frontier are, in part, attitudes towards wilderness. We can find these attitudes in art. Consider this painting: George Innes's "Lackawanna Valley" (Pennsylvania), 1855. In this painting, the foreground shows a farmer reclining in a pastoral field. There are tree-stumps, suggesting that this field has recently been cleared, providing fuel for the railway and making space for a farmer, but it’s not an image of destruction. There are still plenty of trees left, and it’s a sunny day and a gentle landscape. In the mid-ground, a train puffs around a bend, but it is far enough away that its noise, smell, and speed doesn’t seem to startle the resting man. In fact, the train unifies the picture, as the tracks pull together the various elements, and the built environment seems to be a peaceful part of the natural environment. Further back, the round-roofed building is a factory, looking almost home-y, next to what might be a church and a village. In the background, mountains shimmer. Actually, railroads used up so much wood that, in 1860, the U.S. had fewer trees than it has ever had, before or since. Most of our current forests are new growth. Some people resented this at the time, and the other impacts of the railroads which required unprecedented bureaucracy (it was railroads which actually standardized U.S. timekeeping), unprecedented relations with government (to encourage railroad building, the U.S. gave the railway corporations 204,688 sq. miles of land, which is equal to the size of one-third of California), unprecedented profits (the CA railway barons all amassed fortunes between $20 and $40 million), unprecedented power (railroads were resented for how they treated their laborers, and how they could set high prices on farmers reliant on railroad shipping.) This painting doesn’t tell that story, though. This painting welcomes the railroads as an almost-natural part of American progress. Perhaps you can already guess: it was a railroad company that commissioned Innes to paint this flattering portrait. Here’s a very different image of the railroads: In 1901, Frank Norris wrote a classic muckraking novel, accusing the railroad corporations of controlling Callifornia like a monstrous octopus strangling the people of this state. People resented railroad monopolies setting prices on shipping, bribing government officials, and harming people. [A herd of sheep had been trampled beneath this railway car.] “The pathos of it was beyond expression. It was a slaughter, a massacre of innocents. The iron monster had charged dull into the midst, merciless, inexorable. To the right and left, all the width of the right of way, the little bodies had been flung; backs were snapped against the fence post; brains knocked out. Caugfht in the barbs of the wire, wedged in, the bodies hung suspended. Underfoot it was terrible. The black blood, winking in the starlight, seeped down into the clinkers between the ties with a prolonged sucking murmur. Presle turned away, horror-stricken, sick at heart…. Railroads moved so much faster than almost anything else in the nineteenth-century that, when the first railway car took off on its demonstration ride in 1830 in Britain, some people thought it grew larger as it approached. It was only moving 30 miles per hour, but people then weren’t used to stepping out of the way of fast-moving machines. The Duke of Wellington did not step out of the way in time. His legs were crushed, and he died that evening. That was the first of many railway deaths. In Chicago in the 1880s, approximately one child a day lost a limb on the railway tracks: an average of 300 a year. Many of those children died. Even given those facts, Frank Norris’s writing in this excerpt from The Octopus is a bit hysterical. He strategically chose to describe sheep, innocent and fluffy and white, and not, say, iguanas. The main character Presley and his fellow farmers and sheepherders seem entirely innocent, yet actually characters like Presley recently stole this land from Mexicans and Indians, relied on government subsidy for irrigation, and depended on technology like the railroad and telegraph to keep up their agribusiness. 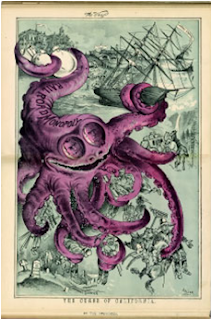 If the railroad was a monstrous, strangling octopus, it was also their main means of support, too. Even as the railroads destroyed forests and herds of sheep, they also promoted wilderness. Yellowstone, Yosemite, and Bryce National Parks were all extensively encouraged by railroad corporations, who wanted to sell railway tickets to tourists. 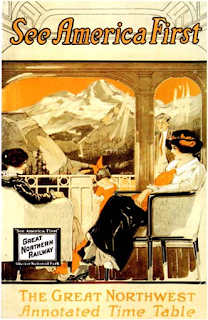 This image is the cover to a 1909 railroad schedule, using the slogan that railroads helped popularize. “See America First” encouraged wealthy Americans to tour the American west instead of the traditional tour of Europe. Thus, even as railroads destroyed the buffalo and other parts of the national environment, railroads also preserved national parks and a certain idea of wilderness. Holding all those perspectives in mind at once is the challenge of thoughtful history. The artist Albert Bierstadt painted this view of Yosemite in 1850 for the railroad corporations, who wanted to promote travel to the west. Notice the lighting: Bierstadt portrayed the park dripping with a syrupy haze, as if to make it sweet. Notice the rock-shapes: the rocks are painted as smoother, slightly less threatening or novel than the actual rocks of Yosemite. Bierstadt was inspired by the Hudson River School of landscape painters, but he was moving away from the Hudson River (in New York State) and helping teach Americans how to view the west. He adjusted the strange landscape of Yosemite to make it look more familiar to easterners – but he also does show something that is recognizably Yosemite, grander than anything in the east. Paintings like his helped promote wilderness tourism and eventually the establishment of the national parks. More significantly than altering the light and the rock-shapes, though, Bierstadt also chose not to portray any people in this park. Yosemite was actually occupied by Indians who fought for the right to remain there. When Yosemite National Park was established in 1864, new rules prohibited the Indians from gathering trout, clover, acorns, fruits, or berries. These rules disrupted the Indian's economy and forced them into waged labor for the park service. In the 1920s, Yosemite's administrator Charles Park declared that the Indians "should have long since been banished from the Park" because their eviction "would ease administration slightly; would eliminate the eyesore of the Indian village... and would remove the final influence operating against a pure status for Yosemite." What Park and Bierstadt didn't understand is that there is very little "pure" nature that is untouched by humans. Thompson thought that the Indian village ruined the view. He wanted a view more like Bierstadt's painting -- but Bierstadt, too, had painted away the Indians. Here's another image of the California landscape, by photographer Eadweard Muybridge in 1873. 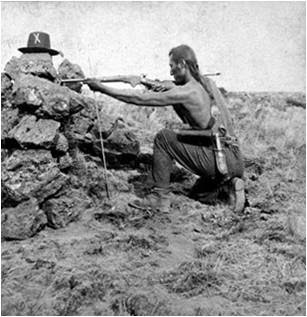 This image shows the "Modoc Indian War" in which Native Americans fought for the right to remain on their land. What do you think: which image should be on the cover of today's national parks brochure? 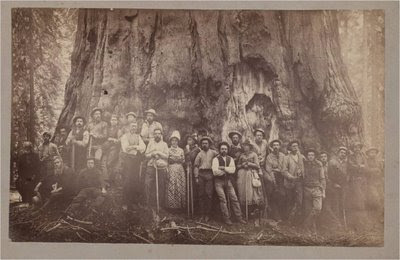 Here's another option: this photograph from around 1886 shows the colonists of the Kaweah Co-operative Commonwealth standing in front of the world’s largest living organism. They called it “The Karl Marx tree.” They were a group of labor activists, hunters, and radicals attempting to start socialism in the United States. They lived in tents, constructed a road into the forests of Central California, and hoped to support their commune by selling timber from the smaller trees. 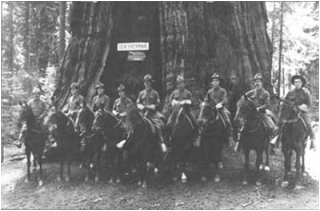 When they contacted the Southern Pacific Railroad to work out prices for shipping timber, the railroad leaders contacted the U.S. congress and had the boundaries of the brand-new Sequoia National Park altered in a way that evicted this small band of socialists. The Kaweah Colonists lost their homes, library, school, and five years’ worth of work on the road. The road they built remained the only road into the national park until the 1930s, but they were never paid for their labor. The trees that they had named Karl Marx, Ralph Waldo Emerson, and Henry David Thoreau were renamed. The tree in this photograph is now known as the General Sherman Tree. You may have visited it, may have appreciated the incredible wilderness of Sequoia National Park, without ever noticing the trail called “Old Colony Road” or thinking about who was evicted to make this park. Federal troops occupied many national parks soon after their formation, a remarkable use of federal power during peacetime. This picture of Sequoia National Park looks quaint, but think about how you would feel if federal troops came riding in to your backyard – especially if you were economically dependent on that backyard. That is the story that Ben Johnson is telling this week. As people like Teddy Roosevelt observed the closing of the frontier, the extinction of passenger pigeons and the logging of entire forests, they started to advocate for government-organized conservation. They believed that government professionals were necessary to protect nature from corporate greed and settler stupidity. Between 1864 and the 1890s, they established Yosemite, Yellowstone, Glacier, and Grand Canyon National Parks, along with 24 million acres of national forests. In these new preservation areas, the new government administrators outlawed the traditional subsistence practices of Native Americans and poor rural settlers. Residents had relied on hunting, fishing, cutting firewood, and gathering herbs and berries to supplement their diets, providing poor rural people with a safety net when crops failed or the economy wavered. Sometimes these residents might overuse the environment, but they often had their own morals, such as insisting people kill only what they needed to eat, never to sell. The new national park administrators hated those local practices. They are “mere destroyers … tree-killers … spreading death and confusion in the fairest groves and gardens ever planted,” John Muir wrote. The government should “cast them out and make an end of them.” The government tried. They criminalized traditional practices, labeling the traditional habits of Indians and locals as “poaching” and “trespassing.” They sent federal troops in to the new national parks. When they found locals hunting, they fined them the equivalent of more than a month’s wages. They did not learn until much later that local practices such as hunting deer actually helped keep wildlife in balance. Local practices like controlled burns helped keep forest fires from growing too large. The administrators thought they were protecting the land, but they were actually endangering it – and driving the local Indians and settlers into poverty. This is Ansel Adams' photo, “Yosemite” (1940s). Unlike Bierstadt’s painting from a century earlier, Ansel Adams’s photographs are crisply focused, offering sharp lines and distinct color-contrast, creating a magisterial view of Yosemite’s Half Dome. Adams’s photographs are enormously popular in calendars, posters, cards, and more. 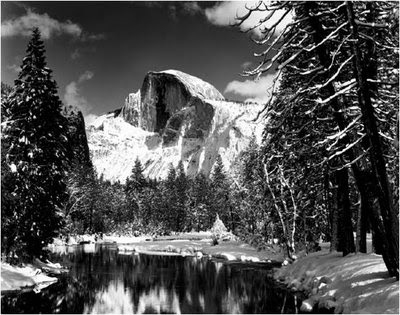 Adams’s photos are part of what made me personally interested in visiting spaces like Yosemite. 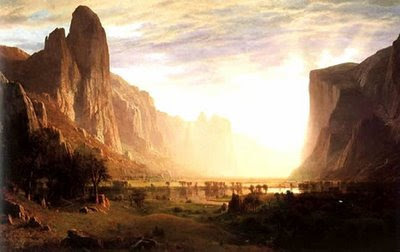 As a teenager, I had a poster of one of his photos on my wall – but now what I notice is that, for all his differences from Bierstadt’s romantic syrup, Adams also doesn’t include any people in his image. He doesn’t even include anything that people have obviously made: he chose to frame his photo in a way that hides the bridges, roads, and campsites that fill the Yosemite Valley. Still, people have made this landscape. Yosemite Indians had used controlled burns to keep the trees smaller, to provide fields for wildlife, and to prevent brush from building up in a way that led to dangerously large fires. National Park administrators did not realize until recently that attempting to prevent all forest-fires actually contributes to eventually more destructive fires. The trees in this photo existed only in the early decades of the national park – not before, with the Indians, and not now, after massive fires have taught administrators to let some areas burn. 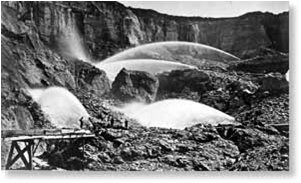 Other administrators decided in the 1920s that, since a national park exists for the greatest good of the greatest number of people, then the greatest good that could be done with the valley next to Yosemite Valley (called Hetch Hetchy) was to dam it, flood the valley, and use the water for the people of San Francisco. Before the dam, Hetch Hetchy had rocks as majestic as those of Yosemite. The fight against damming Hetch Hetchy helped launch the Sierra Club and the modern environmental movement. Yet the early Sierra Club led massive hikes of 50 or 150 people, trampling the land, littering, and not always contributing to what we now think of as sustainability. Those stories are all meant to illustrate that people are in the land, whether we admit it or not. People are even in this photo, even though it takes some analysis to see their effects. 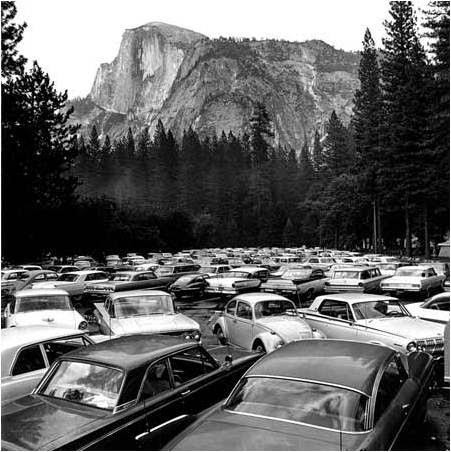 Thousands of tourists to Yosemite strive to take photos like Ansel Adams, but perhaps it would be more honest to include the road and cars and people and buildings, in order to better think about peoples’ roles in the environment. 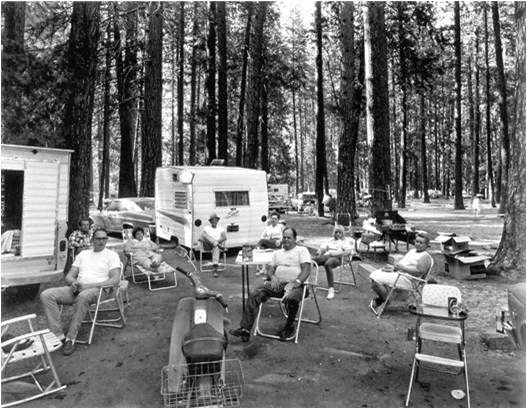 Rondal Partridge's "Pave It and Paint it Green" (1965) and Bruce Davidson's "Campground No. 4, Yosemite National Park" (1966) are not as famous images of Yosemite. They are not what most tourists go to see. But I think they should be famous, because they are what you will see in Yosemite, and they reflect the truth that humans are part of the environment. 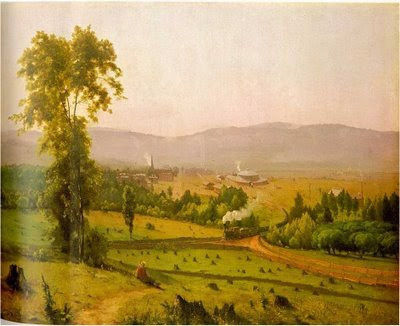 In some ways, Innes’s painting of the railroad in Lackawanna Valley might be a better way to think about the American environment than Bierstadt’s or Adams’s view. Like Partridge and Davison in their photos of Yosemite, Innes in his painting does not try to hide the man and man-made machines that continually affect the natural environment.Innes romanticizes the railroad, certainly, but he doesn’t ignore the railroads – and not ignoring the railroads is part of the challenge of thinking about America’s whole frontier, with all its people and its complex economy, continually extracting value from the land.